Gaily decorated Easter Eggs, spring flowers and pageants make Easter in London a fantastic place to be this year. Booking an Easter break potentially in Park Grand Hotel Kensington Hotel is guaranteed to give you a very different insight into life in London. Instead of simply strolling around historic houses like Hampton Court Palace, why not search out one of the many Easter Egg trails. It certainly provides a lot of extra fun and enjoyment as you explore the buildings and grounds in search of the tasty treats. Stop off at one of the London’s many chocolate shops and choose an Easter egg, Easter bunny or Easter chick. Beautifully decorated, they are a delight to see – but totally irresistible once you start nibbling the delicious chocolate. Good places to look are Melt Chocolate and Fortnum & Mason’s spectacular Easter Egg bar where hundreds of sweet treats are lined up ready for purchase. Planning a visit to the London Eye? Why not book on one of the wonderful Chocolate and Prosecco tasting experiences, which definitely add an extra touch to the scenic views. If you can tear yourself away from the scenes of London’s skyline, you can try a variety of chocolate nibbles courtesy of a Hotel Chocolat Ambassador, before relaxing with a glass of Prosecco. 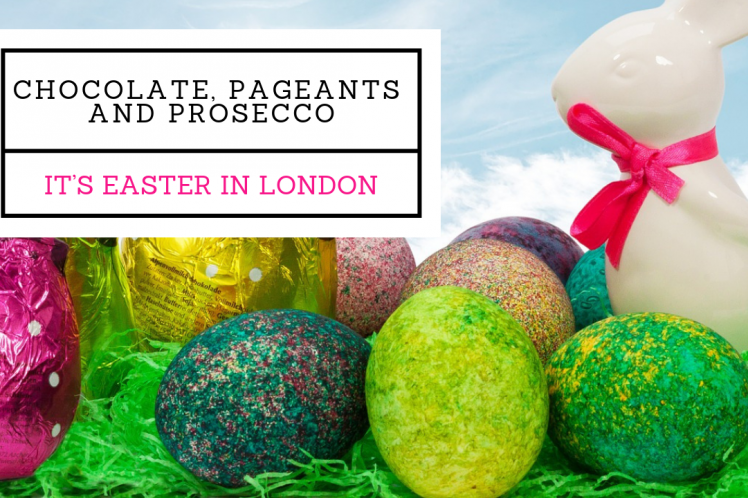 Sit back and watch one of London’s free pageants this Easter. Heading from Greenwich to central London, an actor will be recreating the famous Elizabethan Armarda portrait. Take your seat in Trafalgar Square for one of the most spectacular events this Easter, as over 100 actors, volunteers, horses, donkeys and doves recreate the Passion of Christ. If you can’t get a front row seat don’t worry – good views of the performance can be had from the massive TV screens installed around Trafalgar Square. This is the ninth year that this event has been held, and it has become one of the most popular Good Friday events. It’s well worth the trip to this place during your stay at the Kensington hotel restaurant. Anyone with a family will find lots of fun activities on offer in London’s museums and art galleries including crafts and storytelling sessions. Older children will enjoy a sleepover on board an authentic replica of the Tudor ship, the Golden Hinde which Sir Francis Drake used for his round the world voyage. Permanently moored near the Tudor style Globe Theatre, the sleepovers enable visitors to find out what life was really like on board a Tudor ship, as crew or passenger while trying out the realities of Tudor food.